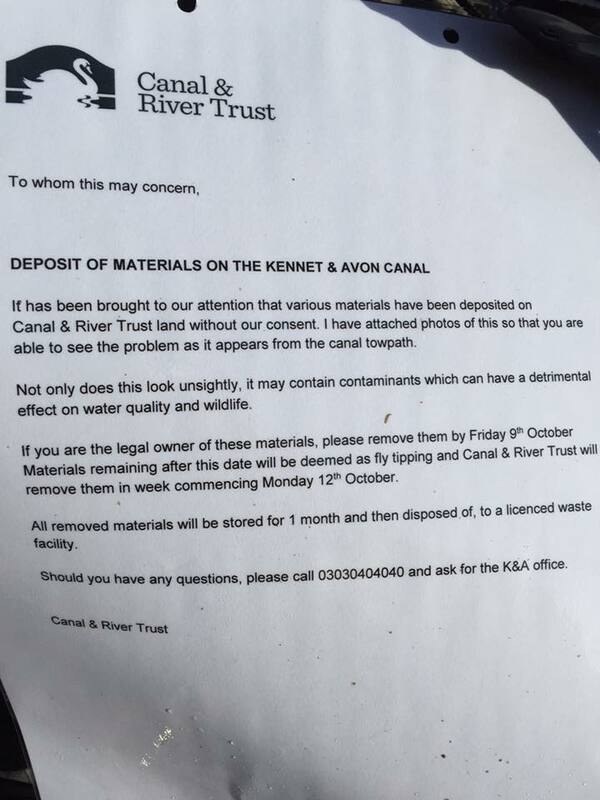 Yesterday in Bath, CRT began affixing notices to boaters’ property threatening that if the property was not removed by 9th October, CRT would seize and destroy it from 12th October. It became apparent that this was happening on other canals in what appears to be national CRT policy. Boaters who have permanent moorings on the towpath and those without home moorings are both being targeted. The notices make the vague and nonsensical allegations that boaters’ belongings are ‘unsightly’ and contain ‘contaminants’ and that they will be deemed as fly-tipped if they are not removed. While it is an offence under the Byelaw 31 of the General Canal Byelaws 1965-1976 to obstruct the towpath, the boaters’ belogings in question are not obstructing the towpath and in any case CRT is not seeking to use its Byelaw powers to remove boaters’ property. Whilst the Navigation Rules within the Boat Licence Terms and Conditions state at 4e that “you must not… obstruct the towpath or use our land for storing items from your Boat”, storage implies a degree of permanence. Boaters without home moorings are not storing items such as bicycles and childrens’ toys on the towpath, they are using them daily for periods of up to 14 days in any one place. CRT has no enforcement powers against ‘unsightly’ boats or belongings. Alternatively, if you have large items of rubbish that you want to dispose of but cannot due to the lack of CRT rubbish bins, leave them on the towpath on 9th October and they will be removed by CRT free of charge. This entry was posted on Wednesday, September 30th, 2015 at 1:41 pm	and is filed under CRT Policy News. You can follow any responses to this entry through the RSS 2.0 feed. You can skip to the end and leave a response. Pinging is currently not allowed.